According to Ignatius, it's "a deep reddish brown, similar to burgundy, bonded leather with gold-embossed lettering." Thanks to Eric for the scoop! I'm looking forward to it. I wonder what Midwest Theological Forum's contribution is in relation to Ignatius Press? Obviously Ignatius supplied the RSV-2CE translation. I wonder who provided the notes (based upon the CCC? Maybe a collaboration? Who is actually publishing it? Well I guess I have to wait to mid-December (if it is ready then). It's a beautiful cover. Matched good binding it can look a good antique in the future. I wish it were plain without any lettering on the front. You wrote: "I would remind people who don't like the the cover of this Bible:'KEEP CALM AND COVER STUFF IN GOATSKIN'"
And, Rolf, I would like to remind you of this: Catholic publishers should just get it right the first time. That's good stewardship. Why, for instance, don't they ask us - those who buy their books - what we think? 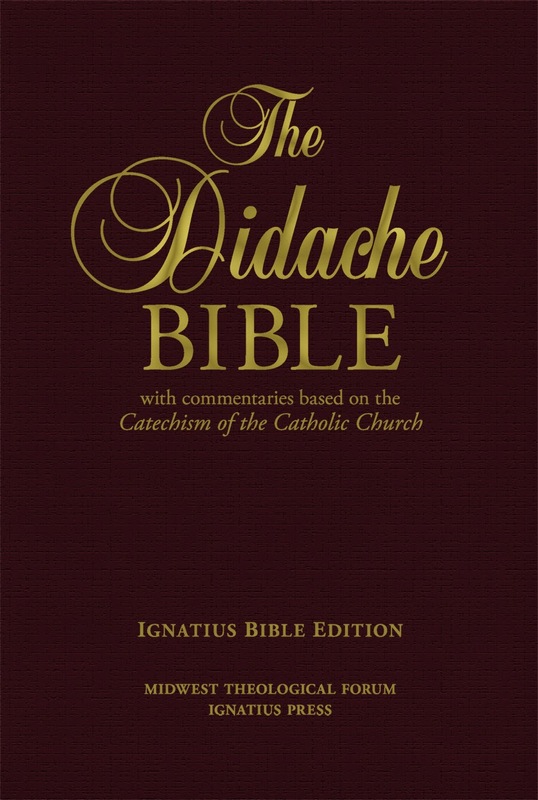 Why didn't Ignatius set up a website about this Bible WHEN IT WAS IN DEVELOPMENT so we, the ones who are inclined to buy good Catholic books, could offer suggestions? No, instead, this was put together in secret with no input at all from readers. It was a complete surprise to all of us. That simply makes no sense in this day and age. It's not only poor stewardship of Catholic materials, it's just plain bad business. Ignatius still has not learned some of the most important lessons from the debacle that is the never ending, and long delayed, production and roll out of the Ignatius Study Bible. For every person that does not like a certain cover on a Bible, there is another person who does like it. Gerald above already posted that he likes it. BTW just for your info, I was joking about the 'goatskin' statement because of Timothy's prior thread. So relax, I am not advocating that everybody has to like it (I personally think it is a little too busy). i don't care about the print edition because i intend to download the e-book anyway. The fact that this is not genuine leather is the deal breaker for me. In my experience, bonded leather covers just don't hold up well. Looks like I'll get the hardcover edition. Well, let me throw my hat into the ring on the cover. On not doing "real" leather - Ignatius' other Bibles have bonded leather as the top end. Why would we expect anything less. I'm guessing that while some people are demanding of genuine or goatskin leather, the market overall might tell them that bonded is good enough to get them the sales they're looking for. Plus, it reflects a sad reality that a lot of Catholics who get their Bibles may not be the voracious Bible readers that the people reading this blog are, and having 'pretty' and'reasonably priced' works better for many of the purchasers than 'pretty', 'durable', and 'spendy'. I will also say that I do like their icons on the regular RSV-2 and Ignatius Study Bible NT. My theory is that Catholic book publishers are allergic to real leather and, in order to avoid allergy symptoms can only use leather fibers mixed with plastic bonding agents. The worst sufferers work at Catholic Book Publishers, unfortunately those at Ignatius Press are also afflicted. The "leather" cover on the RSV-CE2 is cardboard covered in some unknown shiny substance. You'd think they could sub-out a limited manufacturing run of 5,000 or so decently clad bibles to Cambridge or somebody and give quality a try with a limited market. Though I like the cover, Tim, and others there, need not to worry about the inscription. It'll fall off anyway after prolonged use. A good cleanup will eventually make the cover plain except for the traces, but I suppose it will work pretty well enough.